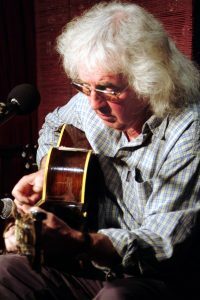 Born in Exeter, Paul played classical guitar in his youth performing a solo recital in Westminster Abbey at the age of 16 before taking up folk music From the age of 12, his best friend was Steve Knightley; then at 16, they met Phil Beer. After giving up a promising academic career, he went on the road as half of the folk duo Downes and Beer. The pair met Bill Zorn, who had just left the Kingston Trio, and formed the Arizona Smoke Revue. When Zorn returned to the states, Downes toured with Pete Seeger before being asked to sit in on the first Joyce Gang gig The Joyce Gang are an Anglo/Irish roots band with whom Downes has recorded five albums. He still plays with the Joyce Gang and as a solo artist, as well as occasional reunions with Phil Beer and Arizona Smoke Revue. Paul formed a collaboration with Mick Ryan, several of whose songs he had previously recorded. Paul plays guitar for Mick’s folk opera The Navvy’s Wife and they are toured as a duo in 2009. He is a long-standing supporter of Exeter Rugby Club. Phil is one of the most popular ambassadors for acoustic roots music. 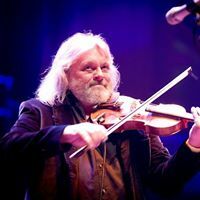 A dazzling instrumentalist, he is perhaps best known as a top flight fiddler playing with Show Of Hands and in the all-star line-up, Feast of Fiddles. He also plays slide, Spanish and tenor guitar, mandocello, viola, mandolin and South American cuatro, not to mention his rich vocals. Born in Exminster, Devon, he started to play fiddle, guitar and mandolin while still at school. He played his first gig at 14 and started working as a duo with Paul Downes in 1974. He was a member of the legendary Arizona Smoke Revue and a key member of Johnny Coppin’s band. 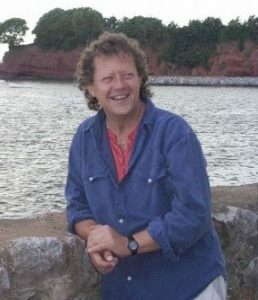 His toured with Mike Oldfield and was a member of the feted Albion Band from 1984-1991. Show of Hands became a full-time partnership in the early 90s, a band that has gone on to sell out the Royal Albert Hall three times and who were voted Best Live Act, by the public, at the 2004 Folk Awards. Wizz began his musical career at the age of 17 leading a Country and Skiffle band called “The Wranglers” in his home town of Croydon, Surrey in 1957. He had been inspired to take up the acoustic guitar a year or so before this after hearing such guitar luminaries as Big Bill Broonzy, Rambling Jack Elliot and Muddy Waters playing at a club in London organized by Cyril Davies and Alexis Korner (The Roundhouse in Wardour Street). Having learned most of his blues licks from Long John Baldry and Davy Graham whilst playing in the coffee bars of Soho, Wizz followed the time-honoured trail – busking throughout Europe with many different musicians including at one time a budding young blues-man named Rod Stewart. It was possibly as a result of Wizz’s appearance in this film and the re-issue of some of his long-lost classics during the 90’s that Wizz began to enjoy a bit of a come-back! More recordings followed notably on the U.S. based Scenescof label which led to Wizz’s first trip to America (see review “Wizz Jones – 1st show in U.S.) and later on an appearance in the documentary film “The Ballad Of Rambling Jack Elliot”. More than a decade on and now hurtling towards the age of 80 Wizz continues to plough his singular furrow leaving a trail of gigs and recordings behind him as he goes! After touring with the late great John Renbourn a duo album on CD and Vynil were produced to much acclaim followed by Wizz’s latest CD “Come What May” which features guitarist Pete Berryman and of course Simeon Jones. Lately Wizz has been re-united with his old busking friend from the Cornwall days Ralph Mctell and tours and recordings have also followed. This well used quote still rings true in 2018 – ‘With his unique guitar style, an eclectic repertoire and “a right hand worthy of Broonzy” Wizz continues to tour on the acoustic folk and blues circuit’. Oh yes I nearly forgot, a surprise performance of Wizz’s 1972 song “When I Leave Berlin” by Bruce Springsteen in Berlin in 2012. Since their reformation in 2004, the Bully Wee Band have proved that they are still a force to be reckoned with as one of Britain’s foremost exponents of acoustic folk/rock music. So successful was the 2004 tour that Colin, Ian and Fergus decided to repeat the experience the following January, only this time with the addition of Bully Wee founder member Jim Yardley. Thus the current line-up of Ian Cutler, Fergus Feely, Colin Reece and Jim Yardley was complete and reunited.